Se Athenes største attraktioner med din egen private gruppe på en hel dags bytur med minibus for op til 19 passagerer. 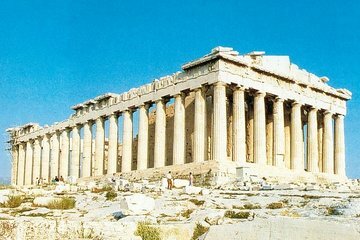 Med en kyndig førerguide besøger du Akropolis i Athen og Akropolis Museum for at nyde de arkæologiske vidundere i denne gamle by, plus se en vifte af andre vartegn som Graven af ​​den Ukendte Soldat og Panathenaic Stadion. Pickup er tilgængelig på hoteller eller cruise havnen. Being a former English teacher, the guide had impeccable English and was very knowledgeable about the sites. She met us at the port as requested and worked with us in planning our 8 hour tour. She knew several ways to get around the lines at the Acropolis and led us to an excellent Greek restaurant in the Plaka area. We saw all the sites that we had planned. 1 On the description it says bottle water is included, so we didn't prepare our own. However the driver didn't bring us any so we ended up buying 3 euro a bottle water. 2 The driver just dropped us off and didn't go with us for visits. We got lost couple of times while the time is very precious as a shore excursion from cruise. It actually served just like a taxi.